I’m Ozma, the DWP Gender Diversity lead in DWP Digital and I’m looking forward to working on this year’s ‘#PressforProgress’ International Women’s Day campaign. 2018 is going to be amazing, I can feel it. How do I know this? Because I started the year with an amazing experience when I went on holiday to Africa (on safari in Zambia and Botswana) and met some truly inspirational women who are pressing for progress. For me, these women really captured the essence of the press for progress campaign; despite being surrounded by poverty they’re pushing for change to make this a more inclusive world by inspiring women, children, and young adults in developing countries to be the best that they can be. My holiday started with an over-night stop in Lusaka, Zambia before the safari began. I organised my own accommodation for the night, through a mutual friend - Mrs Perry who lives in Luskana - and that’s where my story starts. Ingrid Sakwanda, originally from Sweden, is a teacher who’s taught in many privileged schools in Zambia. I rented my accommodation from Ingrid, and got talking to her about my gender role in DWP. Ingrid currently supports underprivileged students wanting to go into higher education. 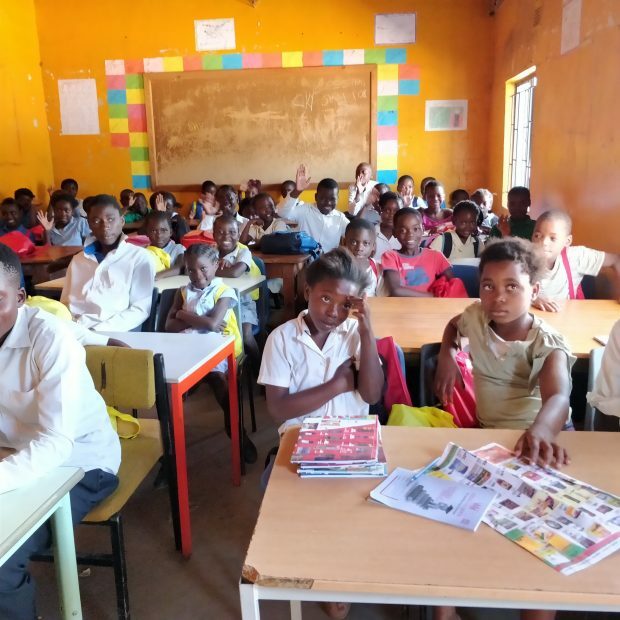 Her Värnamo school programme in Lusaka was started over 20 years ago, with the objective of providing orphans and other vulnerable young people with an education, so that they can look forward to a future where they can support themselves. This programme runs on donations and money raised from craft markets, jumble sales, odd jobs and renting out a guest room - the one I stayed in! In Zambia it costs between £120 and £200 to keep a child in school for a year and between £600 and £1,000 for college or university. It’s not a lot of money in real terms, but as the average monthly income is just over £100, it made me realise that the differences between the rich and poor are enormous there. Although the economy has grown substantially in recent years, more than 60% of people live below the poverty line. The cost of living is so high that people make do with a very simple lifestyle and parents make enormous sacrifices to keep their children in school. Programmes like Ingrid’s help to keep youngsters in education. Most come from deprived backgrounds but they are focused and determined to make something of themselves. For example, 5 years ago the programme paid for an IT course for Purity, a young disabled woman. As a result she is now an IT teacher in a school for disabled children. 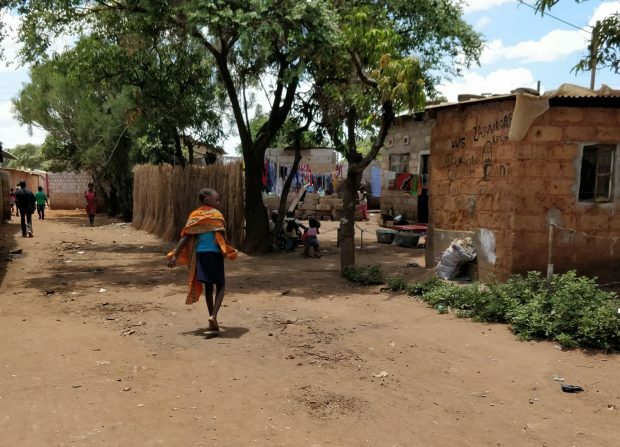 She has her own home and is helping another young woman, one of her relatives, by paying her school fees. She is studying economics by distance learning and also learning sign language. Without Ingrid’s help she would never have had these opportunities. Mrs Perry also put me in touch with Andrea Mwalula, an Educational Consultant and Gender Advocate who founded Twende Education for All (TEFA) in January 2016. It aims to empower vulnerable women and children in Zambia by providing quality education, scholarship programmes and mentorship. I met up with Andrea on my return journey. 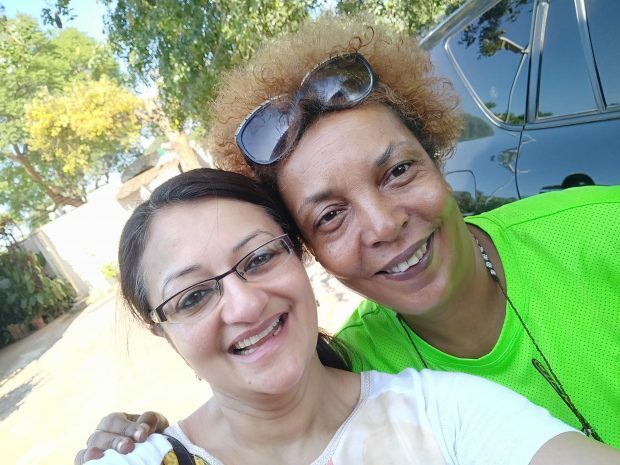 Andrea has been in international education for over 20 years and returned to Zambia to fulfil her life-long goal of making Zambia a better place for all. What I loved about Andrea was her passion for education. Her ‘Girls in School’ Programme (GIS) was designed to ensure that vulnerable and often orphaned girls in villages continue their education. TEFA works in rural areas providing sustainable projects in the community that enable women to work, look after their families and ensure that girls have better protection and equal rights. TEFA formed a partnership with His Royal Highness Chief Chikwanda that has enabled them to successfully integrate and work with the local communities. 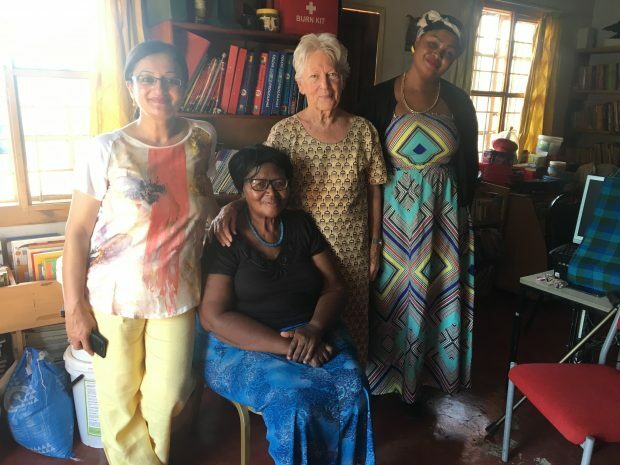 For example they held a workshop for 120 people from the villages in the Lusaka area to provide the local women with a voice. It was a chance to talk about their challenges and identify ways to combat the high drop-out rate of girls from school. In Lusaka TEFA sponsors 12 primary children and 1 secondary school pupil, who is also training as a teaching assistant. As a single mum of 2, she wants to educate herself, get her diploma in teaching and encourage other young single mums to have a goal to work towards. Through Mrs Perry I also met Madam Dorothy who runs the village school in Lusaka. Operating on charitable donations alone, she feeds and teaches 250 children daily. The school provides the children with a meal at lunchtime and thanks to a recent sponsor, milk at breakfast time. Madam Dorothy and her school are a real lifeline for these children, providing them with a basic education so that they can aspire to a better future. I couldn’t help but make comparisons with our Western standards: not surprisingly there wasn’t a single laptop, computer, phone, or IT device in sight. What a stark contrast to the classrooms my own children were educated in. Africa was amazing, and my journey was enriched through meeting all these wonderful women that work so hard to improve the lives of their communities. It really made me more appreciative of everything I have. Now I’m back in the UK I’m looking at how I can work with the Foreign & Commonwealth Office and their cross-government gender equality steering group to raise the profile of global gender equality issues. With International Women’s Day just around the corner and the #PressforProgress theme at the forefront of my mind, I’ll do what I can to make progress for women and enrich the lives of those around me and the people that I meet. To find out more about DWP Digital subscribe to this blog and following us on Twitter @DWPDigital and @DWPDigitalJobs. You can also visit our DWP Digital Careers website and have a look at our LinkedIn page. This is great. It makes you realise how lucky we are in the West. I hope their efforts help all the children to succeed. Wow, Ozma, what inspirational stories. Such good and important work being done and it's great that you are bringing it to our wider attention and promoting the excellent #PressForProgress campaign. Wow Ozma... this is a really insightful blog, full of detail on the barriers to education and employment experienced by women living elswhere on our planet... and all this from a holiday. There is much to transfer here, not only for our international work, but also to our own processes and procedures in DWP. Thank you! Ozma, I agree with Tariq, it honestly does make us realise how lucky we are. Being able to understand the whole concept of #pressforprogress is so important. Keep it up! Very inspirational blog! You have given us a real insight into the work being done by these amazing women in order to shape the lives of all for those they help! Great work Ozma! This is a very insightful blog post highlighting the role of women in the development process. Amazing opportunity Ozma, keep up the good work, can’t wait to see what’s coming up!! Makes you appreciate how lucky we are and how easy it is for us to have a good education! We should all be thankful for the blessings we have in our lives. Ozma baji, you have done a great job. I admire your work. Yes, its true its the time to bring up women to a higher level... Actually, those struggling women are legends for us. How they are working together and how they are promoting education in such areas. They really have a strong vision, to make africa an educatory place. Hats off to you. Ozma, it was delightful to read your Vlog and to see what amazing work is being carried out in Africa. Last year in March I was invited to attend the Million Women Rise March that took place is London’s Oxford street all the way to Trafalguar Sqaure. I was overwhelmed by the number of women that took part from all back grounds. It truely made me realise thats its these women that take time out of their daily lives and give up their time to make a diffrence in the lives of many women all around the world. For centuries women have faught for their rights and those small steps led to what we Women are today we have a Voice! So Good to see all the work you are doing to make a diffrence. Well done. Amazing Blog Ozma. A really inspirational story. It does make us realise how lucky we are. Impressive. Andrea is a go-getter. True humanitarian. A great read, sound like a positive experience and journey! What an amazing experience that you'll take with you forever. Does make you grateful for all we have. #pressforprogress is important wherever we are, but hearing stories like this makes you realise just how important it is in some parts of the world. Great blog. We all need to keep #pressforprogress! This is inspirational Ozma. We do need to be reminded of the plights of others to get an education, what we in western Europe take for granted. This is the best route to developing their own country and is so vitality important for their advancement. I'm proud of you to have researched such a lot on your holiday and highlighted it. Keep up the great work. Great blog Ozma. Powerful and inspirational - shows what we take for granted at times. Ozma ......... WOW what an inspirational read today especially on International Women's day too! An amazing story, Ozma. It really makes you stop and realise just how lucky we are. You met such inspirational ladies who make such a difference to so many lives. Thanks for sharing your fabulous experience! Amazing Ozma,It's really inspirational blog. It's a great feeling when your work is appreciated.Well done and keep it up. Another great blog Ozma. You have a talent for bringing both the important and inspirational topics to people's eyes which in turn makes us realise how fortunate we are. Blogs have at times made me lose interest in what we are trying to promote as the messages have often been lost but your passion and integrity shine through both for the job and subject! Long may it continue! Well done Ozma baji, it's really appreciated. Keep it up well done. I'm so happy for you, you're great. Ozma - thank you for sharing such an interesting & informative blog, it seems like you don't switch off even when you're on holiday! These women are truly inspirational with all the work they do to help others, like just going to school, which we all take for granted in the western world. Absolutely agree with everyone’s comments and we’ll done Ozma it’s so inspiring! I’m sure this is just a start. What a great blog! Truly fabulous and inspirational blog Ozma. I’m looking forward to catching up with you and hearing all about your trip. Im lost for words and so very touched by your blog. We live in a bubble to a certain degree and have an expectation that most things like education, shelter, food and clothing are readily available to us. So its inspiring to read that so many women with the bare minimum help other achieve so much. Brave, strong and resilient women. Well done Ozma for sharing your experience and making us all aware of others in their strive to be better!!!! Ozma this is a fantastic read, thank you for sharing, certainly makes you realise how fortunate our children have been and how we take it for granted. Truly fabulous and inspirational. Thank you for sharing such an interesting story. Keep up the good work I look forward to reading your next blog.